Yarsagumba (caterpillar fungus), a herb prized for its medicinal value, and cash worth NRs. 40 million has been looted from the Phoksundo Village Development Committee (VDC), located in the highlands of Dolpa district in Nepal. This incident of gang robbery is within a day’s walk from the site where a violent police crackdown on the local community took place on 3 June 2014. Such gang robberies in the Dolpa highlands seem to be an annual occurrence. In last year’s robbery, an armed gang stole 140 million rupees from Yarsa traders near the pass that leads across the border to Kyatoe market in China. The robbers are still at large. The case file is gathering dust and the government has procrastinated in bringing the criminals to justice even though it has announced that the robbers have been identified. The involvement of police and local politicians is strongly suspected in these armed gang robberies, as there is inordinate laxity in investigations. In the recent incident, a small camp of ten tents inside the Shey-Phoksundo National Park, which is a three-day trek from the Dunai district headquarters, has been robbed a little after midnight. An armed group, twelve-strong, looted the cash and the Yarsagumba when the traders and pickers were sleeping. The assailants barged into the tents, threatened the occupants, and told them to lie on the ground while they looted the cash and Yarsagumba. 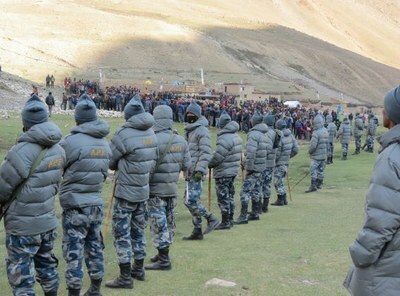 A team of 11 police officers from the District Police Office Dolpa has left for the site of the incident. The Nepalese Army has also dispatched a team from its Rigmo Post to the site, soon after learning about the incident. Hundreds of police and army personnel are readily available to protect the National Park area. This incident of robbery is prima facie a civilian offence. When any kind of theft occurs, it is the primary responsibility of the police to conduct an investigation and if anyone is found guilty, they need to be tried in a civilian court. But systems and institutions are such in Nepal that it is nearly impossible to expect credible investigation and fair trial. On the other hand, one has to see the capacity of personnel that have been dispatched in terms of logistics and skills. Nepal police have limited capacity to investigate such crimes. The most one can expect from the police is that they will catch easy prey and torture them to confess, in the name of investigation. The salaries of both Nepal police and army personnel are a pittance. A dire scarcity of funds can easily work as a catalyst for anyone to become robbers. As the robbery has taken place inside the National Park, the army stationed there has the jurisdiction to conduct a full-fledged hunt for the robbers. That said, how could such an armed robbery be carried out without being known to army personnel stationed there? If no one powerful in Dunai is involved, it would be easy for the army to track down a gang of criminals in such a remote region. Another fact that raises suspicion is that the robbers were carrying serious weaponry, the kind belonging to the police and the army. The involvement of power brokers in Dunai, therefore, cannot be ruled out. Without receiving their active or tacit support, it is virtually impossible to carry out such brazen robberies in Dolpa. As in other parts of Nepal, citizens from this mountainous region have been suffering from absence of rule of law and increased lawlessness of the security forces and the government. The government has neglected its duties and been found incapable of providing basic security in these regions. How can such brazen armed robberies take place year after year and go unnoticed? The Asian Human Rights Commission (AHRC) is concerned that police and local politicians from Dunai might be involved in the armed robbery. Police and the Dunai District Administration Office (DAO) have shown little interest in conducting investigations. Moreover, the police as well as the Dunai DAO have been refuting involvement in the violence in Dho village on 3 June 2014, which is a shameless claim.